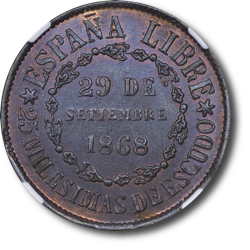 Following the Battle of Alcolea and the departure of Queen Isabel II on 29 September 1868 the first and only commemorative coin associated with Isabel II's reign was issued. This coin commemorates the event and proclaims Spain free. The central type is an aqueduct symbolic of Segovia with legend SOBERANIA NACIONAL on the obverse and ESPANA LIBRE 25 MILESIMAS DE ESCUDO with center inscription 29 DE SETIEMBRE 1868 on the reverse. This commemorative was issued with a value of 25 milesimas de escudo. 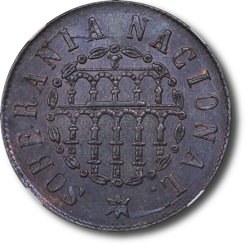 The then current standard for fractional coinage at the time was céntimos de escudo and so this denomination is equivalent to 2.5 céntimos de escudo. It is true that this coin was made after Isabel II was deposed and many think of it as exclusively a provisional government issue. However, the prominence of the date of Isabel’s departure on the coin and the fact that its denomination is based on the escudo system of Isabel’s Spain allows for some interpretation. In this author’s opinion, this can fairly be considered the final coin of the era of Isabel II and an interesting link between her reign and the new provisional government which soon after established a monetary system based on the peseta. This particular coin has stunning deep purple iridescent luster on both sides with hints of red at the perimeter on the reverse.